In today’s Guest Post, we’re looking at the differences between alternative country styles. Enjoy! If you think chintz and ceramic jugs when someone says ‘country décor’ to you, then think again. There is countryside and rural areas to every area in the world, which means that English country style décor is very different to a French or American country style. Take a look at these ideas for a fresh take on country decor. The modern country style embraces all the elements of a traditional English country design, but adds a contemporary twist. Instead of the delicate floral patterns that you might see, you’ll find dark florals layered together along with different patterns for depth and interest. Instead of a subdued palette, jewel tones or bold colours are the order of the day – no pastels here! The natural, rustic element of English country style remains a stalwart of a more contemporary design, however, with wooden tables like those from Fortune Woods and DIY handmade elements staying strong. French country can be one of two styles; pared down and simple, or extravagant and luxurious. At the pared down end of the spectrum, natural materials like wood, cotton and linen shine. Simple lines and a neutral palette with subdued matte blues or greens keep the room calm and tranquil. There is an element of the industrial here too, so show your brickwork and your pipework for that extra simplicity. At the other end of the scale, an extravagant French country style is all about pretty colours, elegant, antique furniture and beautiful patterned textiles. Of course, you can’t have French style without a chandelier, so you need one of these, even if all you’re redecorating is the downstairs cloakroom – no other lighting will do. Think fleur de lis, toile, gilded mirrors, formal draperies and rich wallpaper. Or, Midwestern American style. This is a really relaxed, playful and fun way to decorate. If you’re in love with the idea of a ranch, or the American optimism, then this could be your new decorating style. It still has the natural element to it, with materials like wood, stone and leather being instrumental to an American country style. Rugged and sophisticated, it’s not just about imagining yourself as a cowboy. Go for reds, browns and tan colours with woven textiles and leather furniture. While a cowboy hat might be too much, a pair of faux buffalo horns would work perfectly with a playful attitude. Bring it up to date with faux fur, Aztec prints and string lights like the ones from BrightLightz.co.uk. 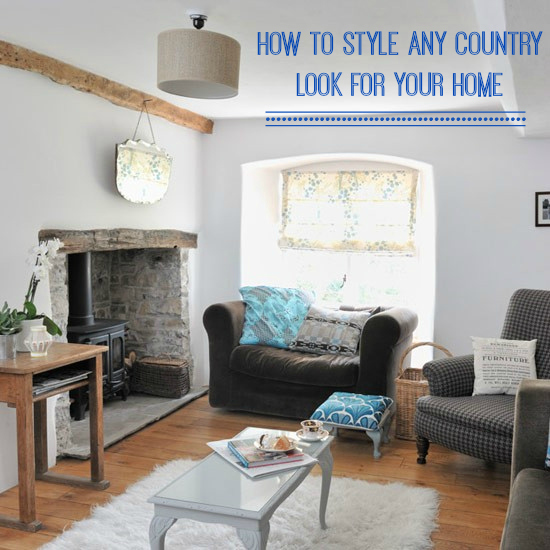 As you can see, country style décor is different wherever you are in the world, but with many elements that remain the same, and so can be adopted by anyone.